A Monthly Journal Devoted to Philosophy and the Higher Development of the Human Race-Physical and Metaphysical / Devoted to Literature. 1/1, 1901-1906. 12 pp., 50 cents - $1.00 a year. 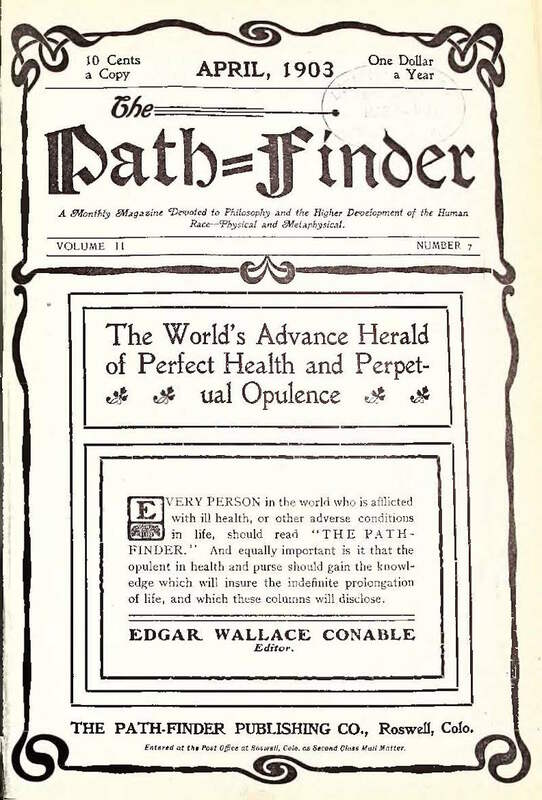 Beginning in 1906 the journal was called Conable's Path-Finder. Conable (1850-1909) was an early natural-foods advocate, author, for example, of Solution of the Kitchen Problem for Woman, on the wonders of uncooked food, but was best known as a "faster," a proponent of physical immortality. He treated the ill and obese at his Conable Sanatorium and Health Institute in Jamacha, California, near San Diego. This was recommended by Charles Lincoln Phifer, the utopian socialist and spiritualist, in The Social Thought, March 1903. Noted in Wings of Truth, 1902, and advertised in Adiramled, January 1902. Its revival "after a period of rest" is noted in Unity, 1907. LOC.